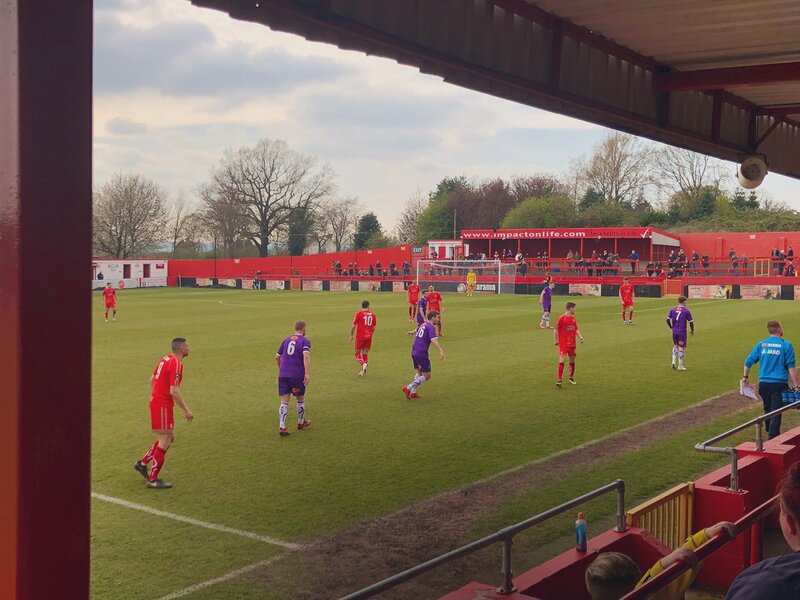 Alfreton Town's six game unbeaten run in the National League North came to a horrendous end as a clinical and destructive Altrincham scored seven goals at the Impact Arena, the Reds worst ever home defeat and the second time seven goals have been shipped at home this season. Billy Heath made just the one change from the Saturday prior with Reece Styche coming into start and Dec Bacon moving to the bench. Alfreton started the game well with Styche firing an early effort wide before Josh Wilde latched onto a loose ball after Danny Clarke was tackled on the edge of the box, but Wilde's shot was blocked away from close range with also claims for a penalty in the aftermath. But Alty soon wrestled control of the early stages as they moved the ball well and stretched the Reds shape, there was always an option for a player in purple and the early possession brought early openings. The Robins had an early corner cleared away before Ceesay broke away from Josh Clackstone on the left but his cross was headed away by Adam Curry. Then with eight minutes gone the visitors took the lead when a cross from the right hand side was mis-judged by Sam Ramsbottom and the ball fell for Ceesay whose header hit the bar before he converted the rebound into the corner despite Curry on the line. The Reds lacked ideas and this was evident with Jordan Sinnott's free kick wide to Curry produced a lofted ball that went straight out of play. Luke Shiels was then booked for a late lunge on the left, Johnston curled the free kick over from the angle. Sam saved well at his near post after a neat dribble brought a powerful shot from the edge of the box, Tom Platt then denied Ceesay a tap in from a low cross with his tackle timed to perfection to deny the winger. We produced our best move of the half on 26 minutes with Styche's pass finding Clackstone on the right, his cross caused issues with a heavy touch from the defender causing panic before Thompson in the Robins net raced onto the backwards loose ball. With 31 gone, Alty made it two as the unmarked Hulme converted a White cross from the left into the far corner. On 38 minutes the visitors were awarded a penalty for an apparent handball in the box, Johnston stepped up and sent Sam the wrong way as Altrincham found themselves in total control heading towards the break. It could have been four before half time with Wilde clearing off the line after a Robins player found himself in space on the right side of the box, his shot had Sam beaten but he was denied by the back-tracking Wilde on the line. Half time brought a mountain to climb with the Reds three down and the performance was one of dis-belief after recent results and the recent unbeaten run. Alfreton were sent out early for the second half with Danny O'Brien replacing Styche heading into the second half. The Reds put up a brief battle at the start of the second half with more intent and urgency to win the ball back in the first five minutes. However chances were not being created and time was against the Reds as Altrincham settled on the ball again. Shiels and Thompson collided going for an aerial ball with the Reds captain needing treatment afterwards and then had to be replaced a few minutes later on precautionary measures due to a suspected head injury. But with the Reds again struggling to create any chances and in turn get in behind the Robins, the visitors soon extended the lead on the hour mark with Hancock pulled free from a crowded box, finding space after a succession of dribbles and he finished low into the bottom left corner, on the turn. Alfreton were then gifted a penalty when Wilde looked to have been tripped in the box, Sinnott stepped up and saw his penalty saved by Thompson with the effort lacking direction. It summed the Reds performance up with a lack of motivation with the scoreline no doubt playing a part in a lack of willing-ness. Sinnott flashed a shot just wide before Sam denied Williams in the box after he went clean through and looked to go round the Reds goalie, the corner nearly brought a connection but we survived yet more damage on that occasion. However Altrincham were not finished and the final five minutes of the game brought another three goals with Cessay making it five on 86 after a superb save from Sam to deny Richman in the box who looked to curl the effort into the far corner, Sam's stop saw the ball fall for Ceesay who headed into the empty net. Poole should have made it six two minutes later but saw his effort saved by Sam at the near post. Never the less it was six on 89 minutes as Hannigan rose highest to power a header which hit Clackstone and went into the corner. Seven came in stoppage time as Jones curled a nice effort into the bottom corner from just outside the box and that, thankfully, proved the last of the action on a truely horrible afternoon; which no one would have dreamed to have occured, for Alfreton at the Impact Arena. Altrincham were outstanding in front of goal and this was coupled with a Reds side who had been fantastic in the six games prior but on Saturday just didn't turn up. A huge reaction will be needed after a new record home defeat and with the unbeaten run also at an end, Billy Heath will demand and expect a reaction not only for pride but for the fans on Tuesday night when Hereford visit us, kick off is 7.45pm. ATFCXI: Ramsbottom, Clackstone, Wilde, Platt, Shiels (c) (Hotte 61), Riley, Styche (O'Brien 45), Johnson, Clarke (Peniket 55), Sinnott, Curry. Subs Not Used: Lynch, Bacon.